Expedition 54-55 is the next crew to launch to the space station. They are (from left) Norishige Kanai of the Japan Aerospace Exploration Agency, Anton Shkaplerov of Roscosmos and Scott Tingle of NASA. The next crew to launch to the International Space Station is in Russia today for traditional ceremonies before heading to the launch site in Kazakhstan. Back in space, the Expedition 53 crew is preparing for the departure and arrival of a pair of cargo ships next week. Three new crew members from Russia, the United States and Japan are getting ready for their Dec. 14 launch aboard the Soyuz MS-07 spacecraft to the space station’s Rassvet module. 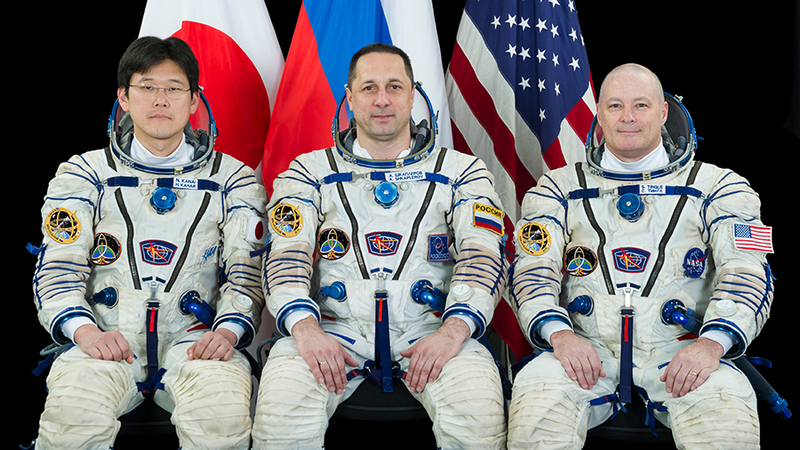 The Expedition 54-55 crew consists of Soyuz Commander and veteran station resident Anton Shkaplerov and first-time Flight Engineers Scott Tingle and Norishige Kanai. The trio was in Star City today talking to journalists before heading to Moscow to tour Red Square and lay flowers at the Kremlin Wall where famed cosmonauts are interred. Next, the crew will head to the launch site Dec. 4 at the Baikonur Cosmodrome in Kazakhstan where they will stay for final launch preparations at the Cosmonaut Hotel. Meanwhile, the orbiting Expedition 53 crew is packing the Cygnus cargo craft with trash before it ends its mission next week. First, ground controllers will remotely detach Cygnus from the Unity module with the Canadarm2 on Dec. 5. Cygnus will then be maneuvered over the Harmony module for a GPS test to assist NASA’s Commercial Crew Program. Next, astronauts Mark Vande Hei and Joe Acaba will take over the robotics controls and release Cygnus back into space on Dec. 6. It will orbit Earth until Dec. 18 then enter the Earth’s atmosphere over the Pacific Ocean for a fiery, but safe demise. SpaceX is getting ready to replenish the station with its Dragon cargo craft scheduled to deliver about 4,800 pounds of crew supplies and science gear. Dragon is targeted to launch Dec. 8 from Florida atop a Falcon 9 rocket and take a two-day trip to the station. Vande Hei and Acaba are training to capture Dragon with the Canadarm2 when it reaches a point 10 meters from the station. Ground controllers will them remotely install Dragon to the Harmony module where it will stay until Jan. 6. I am fascinated with anything about the ISS. Thank you for sharing this with us. Good luck in your mission! You are so lucky you have the chance to go there , in space. It’s hard but it’s so special. And you are so special. Have a nice and smooth flight! Mucho trabajo para expedition53 . Más complicado de lo que muchos puedan creer. Felicito a la expedition53 por su labor y contribución. I love to became a astronomy. My house is in India, gujarat, Vadodara. C/80 JAI VAIKHUTHDHAM SOCIETY TAWONSHIP NO 1 MANJALPUR, VADODARA , GUJARAT, INDIA. please sear a picture of universe.